Illuminated Manuscript Collected works (Kulliyat), Walters Art Museum Ms. 617, fol. 2a, originally uploaded by Walters Art Museum Illuminated Manuscripts. An illuminated and illustrated copy of the collected works of Sa`di (d.691/1292) (Kullīyāt-i Saʿdī) containing, among others, his Gulistān and Bustān. The present manuscript was penned by an anonymous calligrapher in Shiraz (Iran) in 934 AH / 1527 CE. 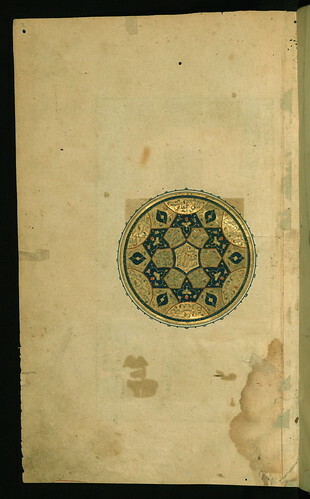 Illuminated medallion with table of contents.